Most breed books start out with "the origin of the ____ is not known." I never started my breed books that way and there is no genetic mystery about the Toy Fox Terrier but read on, AKC breeders have invented one! While the Toy Fox Terrier's ancestors didn't exactly come over on the Mayflower, two came from England. The third breed was from old Mexico. So it is that three primary breeds contributed to one of the most unique breeds ever created in America. Smooth Fox Terrier dominance is obvious in the short back, high tail carriage, stallion-like structure, ticking, and predominantly white body as well as its tight feet, low-set hocks, and terrier attitude. The Toy Fox Terrier may indeed be the result of inbreeding on the occasional Smooth Fox Terrier runt. That inbreeding would have produced deformities and other genetic problems but leave it to terrier people to figure out a solution. How to maintain the classic structure but introduce hybrid vigor without increasing size. Well that was a no-brainer! The world's smallest breed has reduced size in many modern breeds. The Chihuahua's influence in the Toy Fox Terrier is undeniable but early breeders worked hard to minimize the domed skull and open molera. Those great big eyes were also problematic for a dog that hunts and goes to ground but as you'll see, they had a fix for both. Was the Chihuahua's incredible cleverness and human bonding an unexpected or planned benefit? The ancient little dog survived in primitive society due to an uncanny ability to understand and relate to humans. Early American Indians believed the Chihuahua leaves this world to cross the Great River and guide his master to the Other Side. The Toy Fox Terrier would do no less. The Chihuahua stabilized size and corrected bone deformities encountered by inbreeding runt Toy Fox Terriers. It also passed on the trademark low-set ears and non-terrier body length. Something had to be done about that but the early stockmen didn't want to lose the terrier attributes. The lean, flat head and short back of the Manchester Terrier solved the domed head problem, cemented terrier keeness, and re-arranged the ears into a finer, thinner, top-of-the-head prick ear. Was that planned? Perhaps, because the Smooth Fox Terrier's larger, heavier, folded ear all but disappeared in the Toy Fox Terrier. Manchester Terriers are renowned ratters, believed by many Brits to be the best in the world. Recognized in the U.S. in 1923 and subsequently divided in two varieties, Standard and Toy, the toy once weighed in at under three pounds due to inbreeding. The old "black and tan terrier" breeders recognized the danger and it is said that the diminutive Italian Greyhound, the Whippet, and even small Greyhounds were used to stabilize size and increase speed. The coursing dogs also account for the roached back, so untypical of terriers. The recent listing of the IG and Whippet in the revised Toy Fox Terrier breed standard is genetically far fetched. Those breeds are not ascribable to development of the Toy Fox Terrier other than through a minor infusion into the Manchester. Most students of Toy Fox Terrier history are equally as puzzled regards the inclusion of the Miniature Pinscher. It may be there but if so, it's likely to have been much more recent than the close of the UKC stud book in 1960. More below. Breed History is defined as that period of time after a type of dog becomes stabilized and recognizable enough to be readily identified by name. That genetic accomplishment is then followed by formation of a club and finally, formal recognition by a registry such as UKC, AKC, or TKC. So let's look at history, not the mischievous meddling which occurred afterThe Toy Fox Terrier was accepted as a breed by UKC. The Smooth Fox Terrier and Chihuahua contributed the black and tan face markings minus the distinctive "thumbprints" of the Manchester. The Manchester passed on the keenness and determination that made it a legendary "ratter" among terriers. Ideally, the uniquely lean, perfectly proportioned terrier head with moderate stop offsets the stubborn high-domed apple head of the Chihuahua. The Smooth Fox Terrier's body overrides the Toy Manchester 's curved back, rear quarters and lower tail-set. How cool! The piercing, hard terrier expression was softened by the huge eyes of the Chihuahua. We kept the statuesque outline, balance, and courage of the Smooth Fox Terrier but appreciate the calmer, adoring personality of the Toy Fox Terrier. To this day, the Toy Fox Terrier Breed Standard faults any hint of Chihuahua head type and body proportions or Manchester profile. We do however demand the varminty terrier attitude and the toy dog devotion, the combination of which makes the Toy Fox Terrier an intensely attentive pet and show dog! Missing Rat Terrier? The Rat Terrier Club and all registry affiliations affirm it interbred with the developing Toy Fox Terrier but the Toy Fox Terrier Club chose to totally ignore the fact. Seeking AKC recognition, the (AKC) Toy Fox Terrier club steadfastly refuted the genes of any non-AKC breed. It's as simple as that. The Smooth Fox and Manchester terrier are politically correct because they are AKC breeds. The Rat Terrier is not. One must understand the contentious relationship between the two oldest and largest registries in the U.S. in order to grasp the significance. The competitiveness became outright animosity when Wayne Cavanaugh left his position as an AKC V.P. and went on to become the owner of the United Kennel Club. (insert smile) Now you know why the Rat Terrier was totally (and wisely) ignored by new club seeking AKC recognition. Mystery Color? When a small group of AKC breeders sought to popularize the "rare" chocolate color, the Toy Fox Terrier Club Of America revised a breed standard less than three years old! That AKC allowed the hasty revision is in itself remarkable but escalating strife between AKC and UKC may explain it. Some may have reasoned that it lent more "AKC" authenticity since the Min Pin and IG are strictly AKC breeds. Or did it have to do with a "new" color? Perhaps it was to authenticate AKC having put the Toy Fox Terrier into the Toy Group instead of the Terrier Group as in UKC? We know only that the standard was "tweaked" to add more emphasis on the toy breeds, leaving many breeders puzzled or offended by the sudden addition of the Miniature Pinscher and Italian Greyhound as named ancestors! The UKC history is clear and makes no mention of either breed. Many "old time" breeders refute the Min Pin and IG background but we who breed and show in AKC are forced to accept it. While accidents are in the genes of every "purebred" dog, breed historians avoid reaching conclusions that are best left as speculation. New "History." Well, having been presented with new Toy Fox Terrier history, one can only wonder when the Min Pin genes are said to have gotten into the mix and for what purpose? To improve toplines, rears, or showmanship in someone's bloodline? It's done all the time. Next we are left to wonder, did the chocolate gene come from the Min Pin or the Italian Greyhound? Or both? And more to the point, who would be willing to admit it??? The relatively new "chocolate" color in Toy Fox Terriers doesn't please everyone. Geneticists would classify chocolate as foreign to the Smooth Fox or Manchester. A good example of new genetics is the merle debate in Chihuahuas. Iin early 2000, breeders tried to capitalize on the "rare" merle color gene but by 2007, major registries throughout the world had revised their standards to disallow the color due to associated genetic deformities. Chocolate could be from the Chihuahua but then one would expect other characteristics associated with that breed to be evident in chocolate Toy Fox Terriers. Perhaps that is why the revised Toy Fox Terrier standard now mentions the Miniature Pinscher? If I can dig out a credible answer, I will happily report it. Since none of us were around "back then," breed histories are only faulty memories unless documented by public record and photographs. What's In A Name? 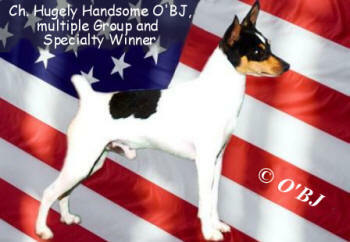 The Toy Fox Terrier is uniquely All American! He is the only Terrier developed in America! Not only that, he is also the only American toy breed! How's that for being distinctive? 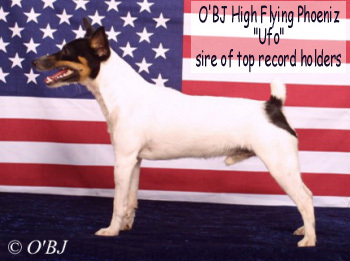 Seeking registration and show recognition as purebreds, breeders preferred to limit background to the runt or "toy" Fox Terrier. Remember now, the Smooth Fox Terrier wasn't accepted by the United Kennel Club until 1912. Knowing genetics (and breeders), it is only logical to assume that even after UKC accepted the Toy Fox Terrier in 1936, people experimented with other breeds. UKC didn't close the Toy Fox Terrier Stud Book until 1960, so other breeds and cross-breds continued to creep into the official records. Finally, UKC literally "closed the book" to the infusion of any dog's genes that had not already been recorded in the official stud book. American Toy Terrier, Ameri-Toy and Amertoy were correct and popular names for the breed but when UKC granted separate breed status, it was as a toy version of the Smooth Fox Terrier. How sad that the only American Toy and Terrier breed had to gain breed recognition as just a runt! For news and information on the dog show scene, subscribe to the www.TheDogPress.com a website for the showing fancy. Subscriptions are currently free! One of the largest (and the oldest) site for all dog owners is www.TheDogPlace.org. You'll enjoy info on the Toy Fox Terrier and most other breeds but TheDogPlace contains a great feature on Agility with Toy Fox Terriers! One of the top Agility competitors in the country is Lisa Herman and as she says "We May Be Tiny but We're Mighty! Go there and see what these little dogs can do!